Real Time Travel Leads are an excellent way to expand your travel business. Prospects respond to one of our travel-specific, online home business ads, like you see on the right. Leads are then delivered to you as a Live, Real Time lead. These leads are targeted to those who have a home-based business in the travel industry and are looking to recruit new distributors. 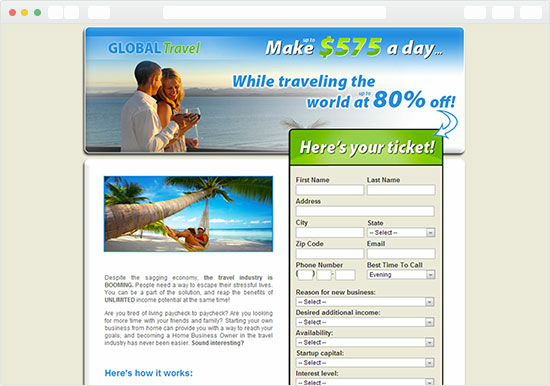 Click on the image to the right and you’ll see the type of landing page these travel prospects came through before you give them a call. Want to customize your leads? There are options available to select by Gender, by Country (US or Canada), by Time Zone and to send (redirect) the lead to your personal website. To choose these options for your real time leads, click on the "More Options +" link below. Our Travel leads are a full surveyed lead, where the prospect has filled out an online survey to further qualify themselves. "The results have been tremendous"
"I've been trying out some various MLM lead sources and ordered the short form real time leads. The results have been tremendous. I've been reaching a lot of live, interested people, and my phone has been ringing off the hook for interviews. I've been recommending you to everybody in my downline." "The most responsive I've ever purchased"
"Just want you to know that your leads are the most responsive I've ever purchased. There are really serious people who want my information than in any other of the MLM leads program I've used. Thanks for your help. I'll order again when I get through all this order." "We are very pleased with the conversion"